1% as of July 1, 2017, and 1% in addition for merit only if the state meets its revenue target of $27 billion. We are working with a coalition of unions across the UMass campuses to improve this offer. See here for more information on bargaining and for an update that we gave last week. The administration plans to charge you for charging electric cars in the new garage. The FSU is fully engaged with all campus unions to develop a strategic approach in our collective efforts to negotiate a fair and affordable agreement over parking. The FSU is represented in the all-union coalition by FSU Vice President John Hess. The FSU bargaining team decided unanimously against physically being at the table at the same time as some other unions but to coordinate bargaining with them. 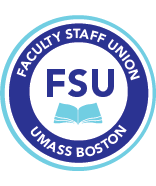 The FSU approach provides us with strength in numbers as we work with the other bargaining units and students and also allows us to get to the table directly with our members' concerns. The Massachusetts Teachers Association (MTA) Annual meeting is Friday and Saturday, May 4-5, 2018, at the Hynes Convention Center, Boston, MA. We will be electing the President and Vice-President of the MTA, so we are looking to fill our slate of 16 delegates plus alternates. Voting for these positions will occur on Saturday, May 5. Let the FSU know if you want to be a delegate or alternate, should a delegate be unable to attend (see here for more information). The elected leaders of MTA make a difference, so we encourage you to participate. ►Contact your legislators to win health care for adjuncts in state universities, community colleges, and all of the campuses of UMass. H 4153 , An Act Investing in public higher education, formerly H 639, would provide adjunct faculty who teach at least 2 (3 credit) courses in a semester or 4 courses in an academic year (summed across all campuses in which they work) the same eligibility to employer sponsored health insurance as other workers. Contact your State Representative and State Senator (Click here to find your legislator) and ask them to support H 4153 An Act investing in public higher education. Ask your State Representative and State Senator to express their support for the bill with Committee on Health Care Financing Chair (Senator James Welch), Vice Chairs Rep. Jeffrey Roy and Sen Joseph Boncore, and the House Speaker and Senate President.